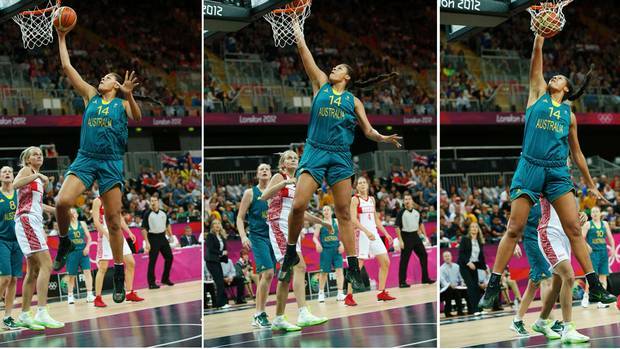 LONDON (AP) – Liz Cambage made the play of the day – maybe of the Olympic women’s basketball tournament. FIBA couldn’t confirm if the 20-year Cambage was the first woman to dunk in an Olympic game. But she and her teammates knew she had done something special Friday in Australia’s 70-66 victory over Russia. “That’s the first time I’ve seen it in the Olympics,” said Australia forward Lauren Jackson, playing in her fourth Olympics. “Even in the WNBA, you see some girls do it, on a fast break but she had the zone around her, she had people around her. She made it look so easy. Cambage said she never has dunked before in a game and rarely tries to in practice. Still, she was happy to provide what’s sure to be a highlight of the tournament. “To have someone dunk at the Olympics, and a rising star of the women’s world game is huge,” Graf said. “It’s one of the many things that will continue to put women’s basketball on the map as a global game. That’s what it does. The dunk in the middle of a 12-0 run that gave Australia (3-1) a 44-33 lead – its biggest of the game. Russia (3-1) battled back to close within 61-58 with 4:22 left in the game on Becky Hammon’s 3-pointer. Australia responded extending its lead back up to 68-62 on Jenna O’Hea’s 3-pointer with 1:27 left. Hammon’s basket with 50 seconds left made it 68-66 before Cambage hit two free throws to seal the victory. “Cambage posterizing people is good for women’s basketball,” Hammon said. “Making plays like that, memorable moments, people aren’t going to remember who won or lost that game. Because it didn’t happen on a breakaway and Cambage did it with such ease, there was not much reaction from the crowd. Australia held a 32-30 halftime advantage despite going without a basket for the final 5:18 of the second quarter. The Aussies led 30-23 after Batkovic’s three-point play before Russia scored seven straight to tie it at 30. Batkovic, who scored the final seven points of the half for the Aussie, hit two free throws with 3 seconds left to cap the scoring.